This post is not about my knitted textiles. I spent ages 11 through 18 in the town of Pawtucket, Rhode Island, birthplace of both Wendy Carlos and David Hartman. In the language of the Narragansett, Pawtucket's original residents, Pawtucket means "place by the waterfall". Oh, waterfall, I hear you saying. That must have been beautiful! Well, no, not really. At one time the series of small waterfalls along the Blackstone River had been a great magnet for textile mills, and later, other industry. The Industrial Revolution that started in England had spread to New England. In fact Pawtucket's Old Slater Mill, built in 1793, is known as the Birthplace of the American Industrial Revolution. Much of the textile industry left Rhode Island in the early to mid twentieth century. Other industry came in to take its place. That waterfall was polluted for much of my time in Rhode Island. By the time I left, many factories along the river were gone. 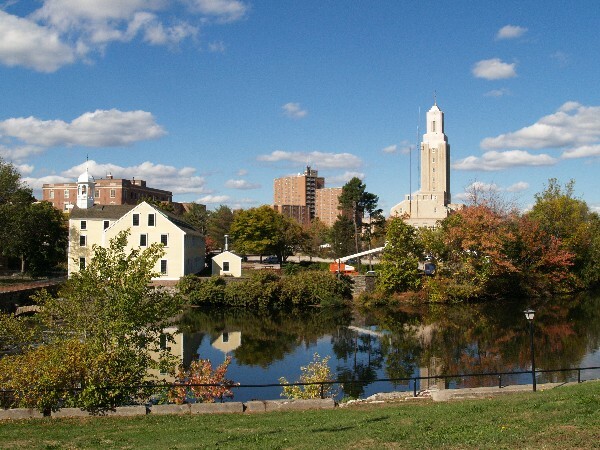 Pawtucket was beginning a beautification and renewal program. Not having any family remaining there, I kind of lost track of what happened after that. Textiles (as industry) spread, flourish, move, die, and are revived. The industry that left New England moved to the Midwest and South. Much of the industry then moved to Asia. Some of this industry has returned to the US in various forms. But there are places, like North Carolina, where it never completely left. The video below is 34 minutes. It's great; do watch when you've got the time. In Cleveland, the Ohio Knitting Mill has been reborn as a knitwear line, run by an "industrial craftsman". This video is less than three and a half minutes. Get a peek into their workspace and catch them making cut and sew sweaters in the video below. The video is a pitch for Ohio Knitting Mill's Indiegogo fundraising campaign, which ended about 2 weeks before I discovered it. I'm very, very interested in seeing how this venture develops. I wish them the best. Meanwhile back in England, I don't know if the women of the independent sewing pattern company By Hand London would call themselves industrial crafters. They do, however, design and create products that crafters (sewists) love. And they've got a great project planned. By Hand London is expanding to produce print-on-demand fabrics. Their campaign has 11 days to go, and they're more than halfway there as I write! You can read about and fund By Hand London's Kickstarter project here. The video is under 4 minutes. I haven't used any of their patterns (yet), and I've done very limited surface design for printed fabrics, but I like where they're going and have happily made a small pledge. I hope they reach their goal.